Our Art Exhibition was a wonderful event. Every child in school and pre-school had a piece of work on display and the effect was magnificent. We raised nearly �500 and celebrated some amazing artistic talent in the process. Our Year Six Leavers' Celebration evening was very emotional, but a lovely end to the school year. Mrs May gave a round up of events that have taken place since September and then presented each leaver with a Complete Works of Shakespeare. Looking forward, she also presented the current Year Five pupils with their new badges of responsibility. There are many new roles (library prefect, IT prefect, assembly prefect, playground prefects and events prefects) as well as the traditional roles of house captains and chair of school council. On 25th June, we held our school fete. It was a great success. The weather was (mostly) kind to us, there was a vast array of food, entertainment and spending opportunities and it was very well attended. Thank you to everyone who came to support. I am delighted that we raised just over �1600. Some of that will be going to the FoL to be spent on more new playground equipment and some will be going to the nursery, to be spent on new resources. Thank you especially to Mrs Al-Hindawi, Mrs Deogan and Lizi, who worked tirelessly on the fete sub-committee to make it an afternoon to remember. We held our Sports Day on 30th June. After a family picnic, the children took part in team games and individual races, before the Mums� and Dads� race and a final whole school relay. Then, back at school, children in the winning house got medals, there were certificates galore and then our wonderful FoL provided strawberries and cream for everyone. It was a real day to remember. Well done to Dahl, winners for the second year running. Skip2BFit came and ran a day of skipping challenges. Nearly every child beat their own record and learnt that practice makes perfect. Everyone enjoyed blueberries and many children are now nagging their parents for more superfoods. Sales of skipping ropes have been really high and the playground is full of jumping children at every opportunity. It was so much fun that we are going to have Skip2BFit coming back to Longwood in the summer holidays! The first FoL quiz was a great success. Thank you to Steve Williams (Owen's dad) for being a brilliant quiz master and to the FoL, led by Tracy Hunt for organising and running the event so well. Congratulations to the winning team! The children all enjoyed Bad Hair Day. This charity day was in aid of Great Ormond Street Hospital and we raised over �130 for the cause. We raised �178 for Children in Need, by dressing as our heroes on 13th Nov. As well as the usual array of Spidermen, Supermen and other action heroes, it was great to see the older pupils thinking about their heroes. Take a look at the photos here. Yesterday we celebrated our Harvest Festival at St James� Parish Church in Bushey. 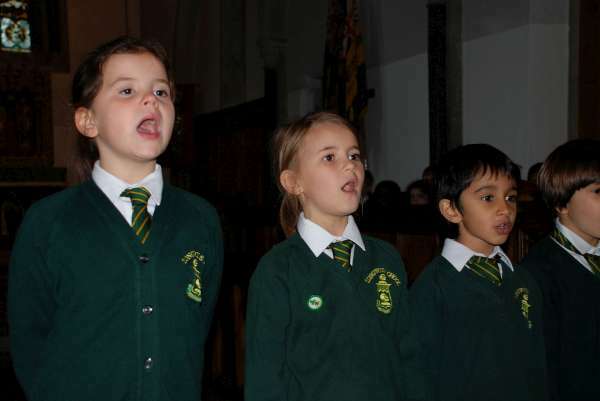 The children had been practising their songs and sung their hearts out, in front of many parents and friends who came along to join in the service of thanksgiving. Father Graham explained how it is important to give thanks not only for the food we eat, but also for all sorts of aspects of our lives. The children in Key Stage One had made a variety of woodland creatures to add to the harvest table, which was already laden with donations for a local refugee charity. Out of clay from the earth, they made beautiful, creative pieces of art. Lower Key Stage Two treated everyone to a dance, and the children in Upper Key Stage Two had written their own rap, saying thank you for science, technology, invention and discovery, going through each century from the 15th century to the 22nd! The standard of singing was impressive and credit was given to our new music teacher, Mrs Sangster, who joined the school in September. Every single child performed with enthusiasm and supreme effort. Thanks go to our incredible staff, who prepared the children so thoroughly and helped to make our harvest festival an occasion to remember. The end-of-term discos were a huge success. This was the first time that we held a "Mini Disco" for our older nursery children and pre-schoolers. This will definitely be repeated! The main disco was great fun with yummy food and lively music. The limbo dancing competition was a highlight, as were the team games. Even the parents enjoyed their child-free time, away from the action, but with some drinks to keep them happy. Thank you to Friends of Longwood for organising such a great event for us. Congratulations to Dahl House, overall winners of the 2014-15 House Trophy. Each week, all the house points were added together, and then into the mix were thrown the results from sports day (also won by Dahl House this year), culminating in a win for the red team. Great job, Dahl. Well done to the other houses too. It was actually quite close in the end. Who's going to win next year? At the end of the summer term, we held a French breakfast. All children from Reception to UKS2 were treated to some hot chocolate and a croissant and jam. Everyone had to have a conversation with Madame first though! This was a great way to use our French and also to raise some money for Muscular Dystrophy.